A youth stands near his name-ox at Yakwach, chanting a praise song. Beside him a boy is looking towards a group of women dancing towards the leftof frame. Nearby can be seen Evans-Pritchard's tent. 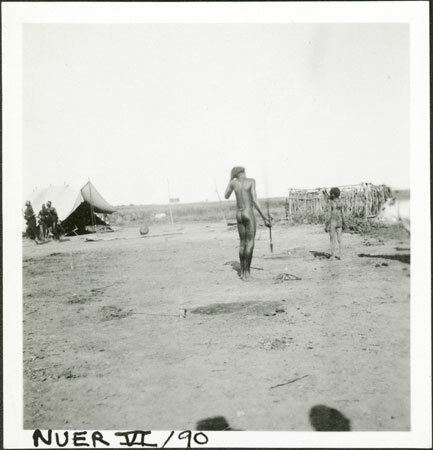 In other images taken from this position men and women can be seen performing an evening dance in front of his tent. In this image a hide drum can be seen propped on a long pole just in front of his tent, which was probably played during the dance. Note on print reverse ms pencil - "64 2 A153" & print front border ms ink - "NUER VI/90"
Morton, Chris. "Nuer youth calling ox-name" Southern Sudan Project (in development). 03 Jan. 2006. Pitt Rivers Museum. <http://southernsudan.prm.ox.ac.uk/details/1998.355.292.2/>.